I agree! They sure had some fun songs. I had the original song about the caissons playing in my mind as soon as I saw the title. They were clever with that one. The lyrics are great, and it had to lighten the day a bit to have somethng so funny and relevant to sing. 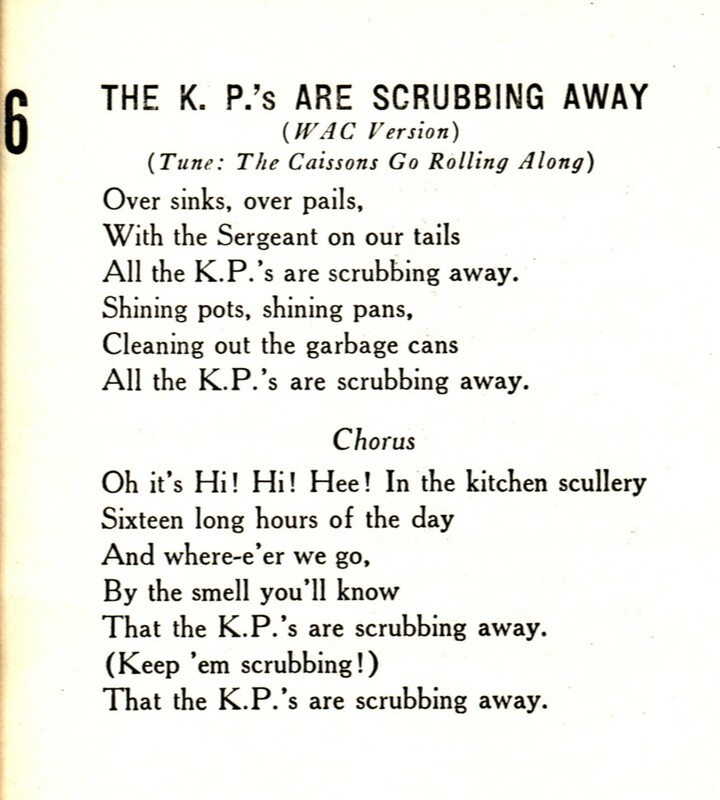 I loved how an official song book included some really fun songs like this one. That is really something. 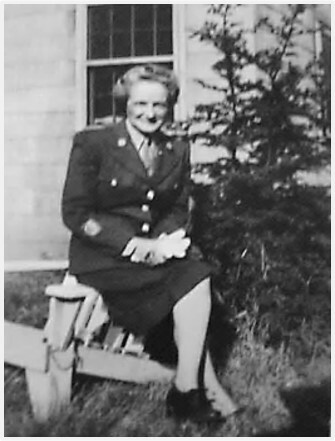 It sounds like being a WAC is a lot of fun. They must have developed a lot of comradery. 🙂 Why do the quirkiest songs always stick in our heads? It’s hilarious! I’m still amazed that they put in into their official song book. Your absolutely right. I once read a really wonderful article about the role that songs can play in helping form a group identity. How fun! 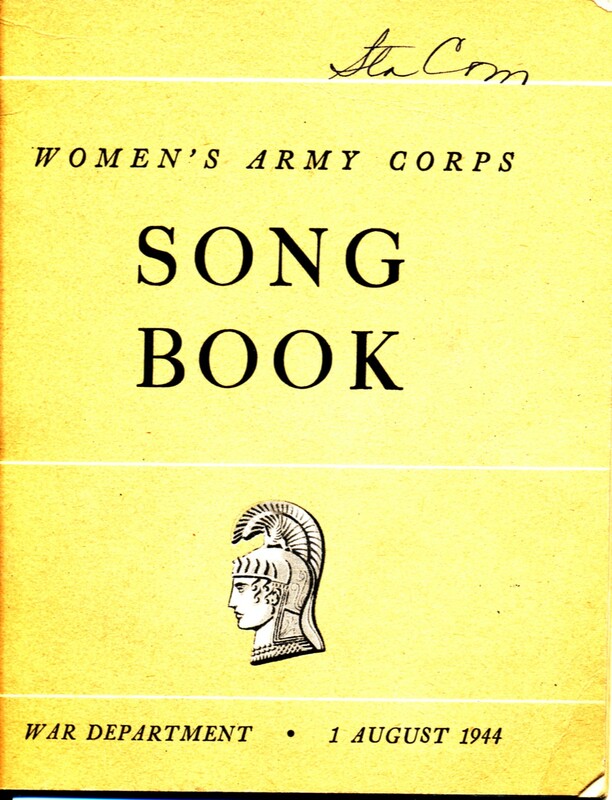 It’s interesting, though, isn’t it, how songbooks like this seem to be such a thing of the past. Does anyone sing anymore? Interesting question. . . I never thought about it before. My first thought was that people still sing, but maybe we all have our own iPods now and are humming to different songs. I actually can’t remember singing a song in a group outside of church since I sat around a camp fire with my daughter’s girl scout troop years ago. I really like the song book. I bet there are many fun songs in there. And what a great piece of history too. It is a wonderful book. And, songs provide so many clues as to what an organization is like and what it’s members value. That was fun! A song book like that is a treasure! It is a fun book. I really like to look at old memorabilia. I sang along as I read the lyrics. Complete fun! It reminds me of a Weird Al Yankovic parody of a song.